Death of Jesus (Wafat-e-Maseeh) Proved from Quran-e-Majeed – For Christians, To be Born Again in Islam! Coming back to discuss Jesus (pbuh) again. Now this one prophet happens to be the central object of the prophetic sphere which categorizes almost three-quarters of world population into believers or disbelievers and hence into different religions. …those who rightly believed him to be a prophet are called Muslims. …there are those who accept him as a prophet and believe him dying of natural causes after completion of his mission. …there are others who accept him to be a prophet yet disbelieve in his death and wrongly believe him to be alive till today even after 2000 years of his birth. You would remember how certain Muslim groups believe that he will return with superhuman qualities and then…, you know – all those stories. So for those who believe that Jesus of Nazareth is still alive, this next section is for them. And, as these believers happen to be Muslims, I’ll put down verses from The Holy Qur’an itself. We have already cleared Jesus of all false charges which the Jews and the Christians put against him. Now allow me to clear Jesus of all charges against Muslim allegations. Second: The traditional belief of the majority of Muslims masses is that Jesus was not put on the cross at all, and that someone else resembling Jesus was crucified in his place. Jesus, instead, is supposed to have been ‘raised’ to heaven or perhaps skies, body and soul. Third: Few of the so-called orthodox Muslim clergy believe that Jesus was a great prophet from God (and a prophet can’t die an accursed death) so was taken away from the cross after being crucified and was shifted to the fourth (or perhaps fifth) heaven to be saved. And again, there are few groups of Muslims who believe that Jesus was taken away from the cross during the storm and was placed somewhere between the seven skies. …Wouldn’t it be too nonsensical to believe this? The First (the correct one): These believe that Jesus did survive crucifixion: He was taken down ‘in time’ from the cross, was healed and had then migrated from country-to-country in search of the lost sheep of Israel and later after completion of his mission, died in Srinagar, the Indian state of Jammu & Kashmir. Re-advent of Jesus was prophesized and signs that would signify his coming were foretold which are believed by all 73 sections of Muslims. True to the prophecies the re-advent of Jesus had happened and… we will discuss this topic in detail in the later part of this ‘Truth Message’; let’s discuss the second and third views now. Insha’Allah you’re going to be more than fine than you are now by the end of this book, Insha’Allah; I’m doing spectacular, by the way, Al’humdulillah! Never been better. The verse from the Quran above points out that there was to be a time when God would clear Jesus of these charges. ‘This Is That Time’. For my Christian cousins I have already established the innocence & well-succeeded life of The Holy Prophet Jesus by The Holy Bible, now let me prove the same before my beloved Muslim family by The Holy Quran. I put before you the evidence of our Holy Prophet, as well as the Holy Quran (the words of Allah) which testify that the charges brought against Jesus (on whom be peace) are all baseless. The truth that I put before you today was discovered and proclaimed approximately 1400 years ago with the advent of His Holiness (saw) himself. There is not a single verse in the Holy Quran where it is written that Jesus (as) is alive today. There is not a single verse in the Holy Quran where it is written that Jesus Christ went up to some skies or Heaven. Let alone Jesus, there is no mention of any physical ascension of any living prophet. No hadith (sayings of Prophet Mohammad (saw)) testifies the physical ascension of Jesus (as) – Not even a single! So depending on The Holy Quran & The Hadees I reject the belief that Jesus Christ went into space to escape crucifixion or is alive up there today. It is obvious that for us Muslims the Holy Qur’an is an authority of the highest grade – it is a confirmed word, so let me first start with this majestic book itself where ALLAH speaks – None in the entire universe has the authority to deny it. THIS AAYAT (verse) PROVES IT PERFECTLY THAT ISA IBN MARYAM HAS DIED AND LEAVES NO ROOM FOR ANY CONFUSION: “The Messiah, son of Mary, was only a Messenger; surely Messengers like unto him had passed away”. [21:9] And We did not give them bodies that ate no food, nor were they to live for ever. Here ‘them’ & ‘they’ specifically refers to Messengers. Allah has not given them a body that ‘ate no food’ (in this world) and now, even if we nonsensically assume that Jesus is up above since 2000 years without food, we cannot expect him to be alive. God, the knower of Past, Present and Future knew full well that Mullahs of later time will assign nonsense stuff to Jesus, the Son of Mary (pbuh), so he already provided us with knowledge through the Verses of the Holy Quran, Subhan’Allah! [33:63] Such has been the way of Allah in the case of those who passed away before, and thou wilt never find a change in the way of Allah. This verse clearly states that ‘All messengers have passed away who had come before Prophet Mohammad’. Jesus (as) had come approximately 600 years before Mohammad (saw). Now, if you believe that the Messiah Jesus is still alive (2000 years later) then God’s statement in the Holy Quran should be wrong, agreed? I wonder, what’s wrong with the Muslims of today who consider the Mullah to be correct and agree with his false views and reject the Truth recorded in the Quran, in the words of Allah, the almighty. For the Mullah, they agree that God himself can be wrong! Extremely, extremely, extremely pathetic! Hence, if any man deserved to remain alive and ascend to heaven, it was our Holy Prophet (saw). If he has died in the usual way, other prophets definitely must have died in the same way. Does anybody thinks that [Astagfirullah Astagfirullah Astagfirullah] Jesus is mightier than the Holy Prophet Mohammad Mustafa (May Peace and Blessings of Allah be upon Him) who is the Nabi-e-Kareem (Chief of Prophets), Khatamun Nabiyyeen (The Seal of Prophets), Khatamul Ambiya (Leader of the elect), Khatamul Mursileen, (Pride of the Prophets)? Astaghfirullah! Coming back to the story: After the short speech and recitation of this verse by Abu Bakr (ra) the companions realized that indeed the Holy Prophet Muhammad (saw) had passed away. NO ONE OBJECTED THAT HADHRAT Jesus (as) OR ANY OTHER PROPHET HAD NOT DIED. Now, if the companions present on this occasion thought that Hadhrat Jesus (as) had been alive in Heaven for 600 years, they would have stood up and pointed out to Hadhrat Abu Bakr (ra), that it was wrong to say that all the earlier prophets had died. Everyone Accepted And Confirmed The Death Of All Previous Prophets. This Was The First Ijma Or Consensus Of The Muslim Community. The family of the Holy Prophet Muhammad (saw) were also agreed on the death of Hadhrat Jesus (as). It is recorded in Majma-al-Bahar that, according to Imam Malik, Jesus died in the natural way. “If Jesus and Moses had been alive, they would have had no choice but to follow me.” (Kathir vol II, p 245 and al yawaqit wal Jawahir, part 2, page 24; Fath al-Bayan, vol. 2, p. 246; Tafsir Ibn Kathir, under verse 81 of Al Imran, Zurqani, Vol. VI, p. 54, Tibrani Kabeer). The Holy Prophet’s words are significant and clear. If, says he, Moses and Jesus were alive. This ‘if’ means that the two are not alive. Moses is not alive, nor is Jesus. This is an important declaration by the Holy Prophet bearing on the subject. After hearing this declaration, no true follower of the Prophet can think that Jesus is alive in Heaven, because, if Jesus is alive, this declaration of the Holy Prophet turns out to be false, Astaghfirullah! In short, the Holy Quran, the Traditions, the consensus of opinion among the Companions and the family of the Holy Prophet, and the opinions of the doctors of Islam all support belief in the death of Jesus. All of them teach that Jesus died like all mortals. All these and scholars (Sahaba of the prophet (saw), Imams, Sunni (Deobandi, Brelvi, Sufi), Shia) can not be wrong all at once. And more than that if Holy Prophet (saw) himself has decided the issue of of Jesus then no Muslim can argue with that. Now are the Mullahs / Muftis of today greater than all of above? Now do we have to reject all of these and believe in the lies of Mullah? Or my dear wise-Muslims, do you think Mullah is even greater than Allah? Astaghfirullah! Choose whom you wish to follow. I recommend: Stop worshiping the Mullah and Start worshiping Allah… this is better for you, if only you knew. Again the question comes: If Hadhrat Jesus (as) could remain alive, why not Hadhrat Mohammad (saw)? OR you think that, Astaghfirullah Astaghfirullah Astaghfirullah Prophet Hadhrat Jesus (as) is greater than Prophet Hadhrat Mohammad (saw)? Chapter 5 Al-Ma’idah: This aayat (Verse) proves it perfectly that Isa Ibn Maryam, Jesus, Son of Mary, had died and leaves NO ROOM for any confusion. Quran confirms the death of Jesus here. ‘Tawaffi’ means capturing of the soul and leaving of the body (death). Still do you believe he’s alive sitting in the 5th sky? [10:101] And He causes His wrath descend on those who will not use their reason (judgment). I will cause you to die. [3:55] And Jesus’s enemies planned, and Allah also planned; and Allah is the Best of planners. Jesus was FIRST caused to DIE and then was RAISED towards Heaven. We must observe the ordinary rules of language. What is mentioned first, must take place first. But maybe the Ulema know these rules better than God. Maybe they think that although ‘raising to God’ occurs later in the verse, it should have been earlier. But God is Wise beyond conception. He knows best how ideas should be expressed. In His speech, there can be no error, no deviation from the correct word order. He is our Creator and we are His creatures. We dare not find errors in His speech. We are ignorant and He is All-Knowing. How can we point to faults in His speech? But few Ulema seem to think there could be errors in the speech of God but not in their understanding of it. So, we see, the verse clearly indicates that Hadhrat Jesus (as) was to die a natural death and then only would he be raised to Allah though with some dirty charges by those who disbelieve. However there’s also a promise to ‘clear him of all charges’. The words `exalt thee‘ come after the words `cause thee to die‘. We have no right to change the order of the words of The Holy Quran. The word used is mutawaffi, derived from tawaffa which means to take away the soul, i.e, death. So, in this verse also ‘Tawaffi’ means capturing of the soul and leaving of the body (death). Zamakhshari (467-538 A.H), an Arab linguist of great repute explains, “Mutawaffika means, I will protect you from being killed by the people and will grant you full lease of life ordained for you, and will cause you to die a natural death not being killed (Kashshaf).” Scholars and commentators like Hazrat Ibn Abbas, Imam Malik, Imam Bukhari, Imam ibn Hazm, Imam ibn Qayyin, Qatadah, Wahhab and others are of the same view. The Promised Messiah challenges: Tawaffi means ‘Capture of Soul & Death (of the physical body)’. He challenges that none can prove this wrong from any verse of The Quran or any sayings of The Prophet Mohammad. Regrettable is the fact that with mere references to ‘Al’haad’ and ‘Tehreef’, few of the Muslims have understood the meaning of ‘Tawaffaitani’as ‘Raffatani’ and didn’t care that these go exactly against the Quran. Tawaffi is used not only in Quran-e-Kareem but also occurs in the Sayings of Prophet Mohammad (saw). Another important word Rafaa’ is used which only means ‘exaltation of status’ and not a physical ascension – Hadhrat Jesus (as) was exalted (or raised) in his status in the view / opinion of God. (b) Praying to the Lord: O lord! I have prostated one time on this land and want to prostate the second time (sajdah) in the sky. Question: Was ever there any worshipper who asked for this? Did you ever? Nay, you pray for exaltation in Ranks, not for ascensions to the skies… Agreed? Now here are words Rafa’a Hoo Ilaihi used for the Holy Prophet (saw) had never been interpreted as his corporal ascension to heaven. Is it not strange and outright blasphemy to interpret the word Rafa’a for the Holy Prophet (saw) as exaltation of his ranks, and for Jesus (as) as his physical ascension to sky? Think about it dear Muslims. Ah! Big one. Let’s break it into single sentences to understand clearly. Refers to the argument of the Jews that they killed Jesus (as) by Crucifixion – In the first part of this ‘Truth Message’ I have cleared this point completely that the Messiah, Jesus, son of Mary, never died on the Cross instead survived it to complete his mission. The Quran rejects the slaying of Prophet Jesus (as) in any form, including killing or by nailing to the cross. Nothing in the verse suggests Hadhrat Jesus (as) was NOT nailed to the cross: He was definitely nailed; the verse only denies Jesus’ DEATH by nailing to the cross. ‘Ma Salabu-hu’ means, they did not cause his death on the cross. ‘Salab’ being a well-known manner of killing. They say ‘Salaba al-Lissa’, i.e., he put the thief to death by putting him on the cross. The verse does not deny the fact of Jesus being nailed to the cross but denies his having died on it. The words “Shubbi-ha la hum” means ” Jesus was made to appear to the Jews like one crucified”; or the matter of the death of Jesus became obscure or dubious to them.” The question arises, who is the person who was made to appear “like one crucified.” Clearly it was Hadhrat Jesus (as) whom the Jews tried to crucify or slay. The theory invented by some Muslim commentators that someone else was made to look like Hadhrat Jesus (as) and was then crucified in his place, is simply absurd. The context of the verse cannot be twisted to make room for someone else. No one else is mentioned. Besides, the belief that God made someone else, an innocent person, look like Hadhrat Jesus (as), and die in his place, makes God look very cruel – No chance! ‘Shubbiha ‘alaihi al-Amru’ means, the matter was rendered confused, obscure or dubious to him (Lane). And the expression, ‘Ma Qatalu-hu yaqinan’, means, (1) they did not kill him for certain; (2) they did not convert it (their conjecture) into certainty, i.e, their knowledge about the death of Jesus on the cross was not certain. In this case the pronoun ‘hu’ in ‘Qatalu-hu’ would refer to the noun Zann (conjecture). The Arabs say ‘Qatala al-Shai’a Khurban, i.e he acquired full and certain knowledge of the thing as to dispel all possibility of doubt about it. (Lane, Lisan & Mufradat). ‘they (Jews) have no certain knowledge thereof, but pursue only a conjecture; and they did not arrive at a certainty concerning it. The Jews were left confused on this point, they were not certain about the ‘death of Jesus’. Jesus was however, not killed, but was rescued. ‘On the contrary, Allah exalted him to himself. And Allah is Mighty, Wise. Here the word Rafaa’ is used which only means ‘exaltation of status’ and not a physical ascension. No mention of a sky or heaven with number is mentioned; factually, Hadhrat Jesus (as) was exalted (or raised) in his status in the view / opinion / judgment / eyes of Allah. Humans, according to the Quran, must live and die in the physical universe. The notion that Hadhrat Jesus (as) floated into the sky towards God is an Un-Quranic concept. Before going into the specific verses which refutes this popular belief, it should be noted that going over to Skies or Heaven happens in a spiritual state only which our souls experience AFTER death; bodies remain dug in the earth. And again, Heaven or Skies are not physical locations beyond the stratosphere… by climbing Mount Everest you do not come closer to God. And the Quran declared: Alam Najalil Arza Kifaatan Ahya’an Wa Amwaatan–“[77:26] Have We not made the earth so as to hold [77:27] The living and the dead? So you see both the living & the dead are to remain on the earth only. Was this earth not sufficient enough for Jesus then? FYI: Only souls have access to the Heavens and this happens only after Death. If any human being was to be able to go to heaven with his physical body then it would have been our beloved holy prophet Muhammad (saw), the greatest of all prophets. But the verses above indicate that since he is but a man, it is not possible. Knowing this, how can we think the Holy Prophet (saw) should die in the normal way and be buried here in this earth, and Hadhrat Jesus (as) should go to Heaven and remain alive for these two thousand years? And again come the question: Do the Muslim clergy believe that Jesus was senior (God forbid) than status of His Holiness Prophet Mohammad Mustafa (May Peace and Blessings of Allah be upon Him) who is referred to as Nabi-e-Kareem (Chief of Prophets), Khatamun Nabiyyeen (The Seal of Prophets), Khatamul Ambiya (Leader of the elect), Katamul Mursileen, (Pride of the Prophets), etc. because they believe that This Holy Prophet can die, but Jesus cannot die!!! The Holy Quran, 48:24 says: Such has ever been the law of ALLAH; and thou shalt not find any change in the law of ALLAH. This is put down more properly in the below verse. Thus the Prophets, like all humans, lived and died on the earth. None had the access to heavens, including our Saviour and Master, The Holy Prophet Mohammad (saw). Peace be upon you always, my dear prophet. Jesus is enjoined to Pray and give alms so long as he lives and the so-called orthodox Muslims Mullah preach that Jesus, even after 2000 years since his birth, is alive today. Coming back to point: Jesus was a great prophet and obedient prophet so would do everything enjoined to him by the Lord. And all orders come to end with his death, so expectations of alms are dismissed, sorry! Peace be upon the whole life of Jesus. Here we see greetings of peace extended to Jesus three times: At the time of his birth, the day on which he dies and the day when he shall be raised, naturally in the Hereafter. No mention is made of the time when he would migrate from this planet to the skies… why is it? Rafa & Nazul are not mentioned at all! Are these not important in the eyes of the Almighty? These are the rarest of attributes not given to any human, isn’t it? Or does it mean that there no peace to him when he is up there till the time he comes down? I have no answers; you take the lead please, thank you. If you ask me, I’d say, this thought of placing him in the 4th of 5th sky or temporarily in heaven never occurred to the Lord and so he didn’t quite require mentioning them anywhere in his book! [22:6] O people, if you are in doubt concerning the Resurrection, then consider that We have indeed created you from dust… … And We cause what We will to remain in the wombs for an appointed term; then We bring you forth as babes; then We rear you that you may attain to your age of full strength. And there are some of you who are caused to die prematurely, and there are others among you who are driven to the worst part of life with the result that they know nothing after having had knowledge. And thou seest the earth lifeless, but when We send down water thereon, it stirs and swells, and grows every kind of beauteous vegetation. You will agree that, ‘driven to the worst part of life with the result that they know nothing after having had knowledge’ relates to the old age of Man and so now we must think that if Jesus is supposed to be 2000+ years of age, is he strong enough to come back and complete his ‘supposed’ mission? [36:69] And him whom We grant long life — We revert him to a weak condition of creation. Will they not then understand? [30:55] It is Allah Who created you in a state of weakness, and after weakness gave strength; then, after strength, caused weakness and old age. The first state of weakness in infancy, strength refers to adult age and weakness again is old age. [23:16] Then after that you must surely die. Laws of Nature apply to all who are born in this earth, then why do we eliminate Jesus from this and apply some new law which was neither recorded in the Book of Allah nor was told by the Holy Prophet Mohammad (saw)? Ch.25:21: And we did not send any Messenger before thee but surely they ate food and walked in the streets. And We made some of you a trial for others to see whether you are steadfast. And thy Lord is All-Seeing. Are we not sensible enough yet to understand this simple thing? Not the wise, but the mad Mullah has made us believe in this stupid tale of Jesus (as)! [30:41] It is Allah Who has created you, and then He has provided for you; then He will cause you to die, and then He will bring you to life…… Glorified be He and exalted above that which they associate with Him. Four stages of Human life are set down by the Lord of the world, how is it then we have created a fifth specifically for Jesus, whereby he is taken away to the skies alive? Was any other prophet ever flew to the sky alive? And even if certain paranormal event is to be attached to anybody, Quran would specifically have record it. But we find no reference of Jesus flying to fifth sky or about his temporary ascent to heaven in the Quran. [55:27] All that is on it (earth) will pass away. Then how can we assume that Jesus did not pass away even after 2000 years of life? [4:79] Wheresoever you may be, death will overtake you, even if you be in strongly built towers. And if some good befalls them, they say, ‘This is from Allah;’ and if evil befalls them, they say, ‘This is from thee.’ Say, ‘All is from Allah.’ What has happened to these people that they come not near understanding anything? This means that if Jesus was to ascend to the skies also, he would have to face death, there’s no escape. ‘…… Did not Messengers come to you from among yourselves…..’? Jesus, the travelling Prophet died at the age of 120 years. [23:51] And We made the son of Mary and his mother a Sign, and gave them refuge on an elevated land of green valleys and springs of running water. Wow! Green valleys and springs of running water… …Kashmir again, my paradise! Well, coming back to concepts, there are several Hadits which proved that Jesus (as) had died at 120 years of age. The Holy Prophet does not say anything on his Own, but reports what he received from Gabriel the angel of revelation. The important part of the statement is that Jesus lived to a hundred and twenty years. According to the New Testament records, Jesus was about thirty-two or thirty-three years old when the event of the Cross took place and Jesus ‘ascended’ to Heaven. If Jesus really did ‘ascend’, his age up to the time of the Holy Prophet comes to about six hundred years, not a hundred and twenty. If what the Holy Prophet received from Gabriel is true, the Holy Prophet should have lived for at least three hundred years. But he lived only for sixty-three years…. or will now the Mullahs will stand to contest that Mohammad (saw) lived for 300 years? Or if you think Jesus is still alive up in the skies, so naturally Mohammad (saw) should be alive too counting by half his age of life, isn’t it? Kanz-ul-Ummal (Vol. 2) which is a comprehensive Book of Hadith, has on page 34 a Hadith from Abu Huraira: God directed Jesus (on whom be peace) ‘O Jesus! Move from one place to another’ — go from one country to another lest thou shouldst be recognised and persecuted. Again, in the same Book, on the report of Jabar, there is the Hadith Jesus always used to travel; he went from one country to another, and at nightfall wherever he was he used to eat the vegetation of the jungle and to drink pure water. Again, in the same book, there is a report from Abdullah bin Umar: The Holy Prophet declared that the most favoured in the sight of God are the poor. Asked, what was meant by the poor? Were they the people who, like Jesus the Messiah, fled from their country with their faith? So we see how people refer to Jesus as example to mention travelling through countries. (2) He travelled in many parts of the world and was therefore called the ‘travelling prophet’. Well, come back to concepts, people! This is a serious thing. The fact that Jesus (peace be upon him) is dead is clearly mentioned in the sayings of the Holy Prophet Muhammad (peace and blessings of Allah be upon him). “The Messenger of God said that, on the night of the Mi‘raj, he saw Adam, Joseph, Moses, Aaron, Jesus and Abraham, in the heavens. Assuredly it was their souls.” (Kashf al-Mahjub, Chapter al-Kalam fir-ruh, p. 204). The above Hadith is corroborated by another that tells us that in the Mi‘raj vision the Holy Prophet met the spirits of all the previous prophets (see Tafsir Ibn Kathir, Urdu ed. published in Karachi, vol. iii, p. 18). And we have already concluded that only souls can reach heaven, no physical bodies. Even after providing you with so many proofs from The Holy Bible, The Holy Qur’an, The Hadith and even from available historical evidences… if you still think all my proofs fail to prove death of Jesus, then perhaps all of us should believe that Jesus never died (I agree) and nor did any of the previous prophets either (agree with me now)! Literally, because we have so many proofs proving death of Jesus and yet we do not want to accept it… then in this case, why should we accept that any other prophet died? No other prophet’s death is so widely and detailedly discussed as His Holiness Prophet Jesus’ and yet we do not believe, so in this case, as there’s not much information available about death of Prophet Adam (pbuh), Prophet Noah (pbuh), Prophet Moses (pbuh), Prophet Joseph (pbuh), Prophet Issac (pbuh), Prophet Abraham (pbuh), Prophet Mohammad (saw) & lets include all the 1,24,000 prophets and believe that all of them are alive… lets believe that all are alive, why not, ain’t it? Well, yeah. They all are alive, not physically but spiritually because their names are preserved in our Holy Books and their love in our hearts. We love them and we follow their models in our life and we want to be righteous like them. But Physically – They’re All Dead. And if you guys cannot believe in the Qur’an-e-Majeed, the word of Allah, in the sayings of His Holiness Prophet Mohammad (saw) – our Master & Saviour, the consensus of opinion among the Companions and the family of the Holy Prophet himself, and the opinions of the wise-Scholars of Islam THAT Isa (as) is dead, then I’m afraid… you’re not a true Muslim because a true Muslim believes in all of the above. But perhaps for you the Mullahs of today are greater than all of above? So you reject all of these and believe in the lies of Mullah? I recommend: Stop being the Slave of Mullah – Start being the Slave of Allah… this is better for you, if only you knew. Everybody knows that peace is a quality of the human mind and sleep a function of human brain. Animals, garments, green fields, quails (salwa), iron, and other things grow on the soil or come from under it. They do not descend or drop down from heaven or Skies if you’re referring to it. Nor is their descent from heaven a description sanctioned by the Holy Quran. At [6:131]: ‘…… Did not Messengers come to you from among yourselves…..’? So re-advent of Jesus (as) would never come flying from the skies, as expected. Most people forget that the word descend has been used in the Holy Quran for the Holy Prophet also. All commentators of the Holy Book take this expression to point to the greatness of the Holy Prophet and to the importance of his advent. And they are right; for, as all the world knows, the Holy Prophet was born in the house of honourable Quraish parents. The name of his father was Abdullah and the name of his mother Amina. Now it is amazing that the same word nazul is used about the Holy Prophet and the Messiah. Yet, that same word is interpreted one way for the Holy Prophet and quite another way for the Messiah. 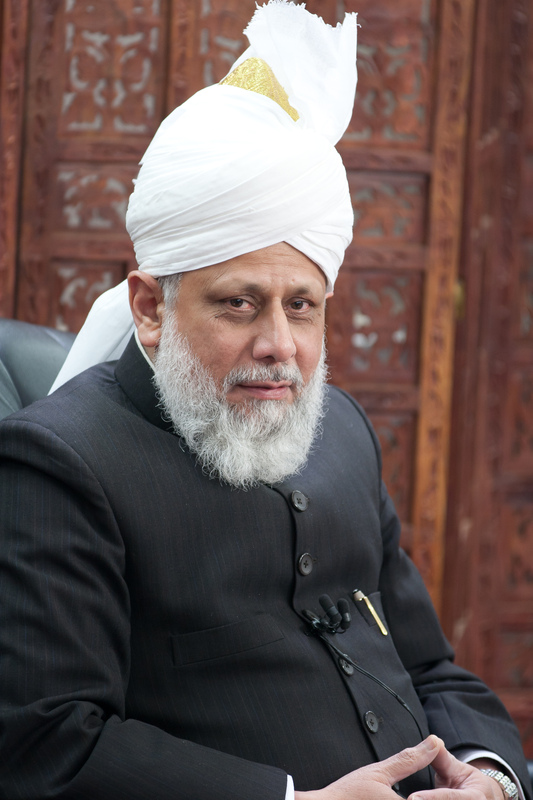 The Holy Prophet was born like any other human on this earth and grew up to be a prophet. The event was described as nazul (literally, descent). Why not mean the same thing when the same word is used for the expected Messiah? Why not let even the Messiah descend in the ordinary way, that is, born on this earth and grow up to be a prophet? In order to prove the physical ascension of Jesus (as) to the heavens, few Muslim scholars argue that the Holy Prophet Muhammad (saw) also ascended bodily to the heavens during the night of Shab-e-M`erāj. Therefore, they say that it is not impossible for a human being to physically go to the heavens. [53:11] Then He [Allah] revealed to His servant [Mohammad (saw)] that which He revealed. [53:12] The heart of the Prophet lied not in seeing what he saw. [53:13] Will you then dispute with him about what he saw? The Holy Qur`ān and Hadīth mentions that Mohammad (saw) saw God through his heart Only. Many ahadīth also prove that al-Isra and Merāj are two separate incidents. The incident of M`erāj happened in 5th year of his prophethood at the time when the Holy Prophet (saw) was sleeping in Ka`aba. Whereas, the Isra incident happened in 11th year of Prophethood while the Holy Prophet (saw) was sleeping in his cousin Ummi Hānī’s (ra) home. The fact that he was sleeping in both cases clearly demonstrates that these incidents were spiritual and not physical. Oh dear! I see clouds of confusion in your skies… leme clear them. [53:11-13] Then He [Allah] revealed to His servant [Mohammad (saw)] that which He revealed. The heart of the Prophet lied not in seeing what he saw. Will you then dispute with him about what he saw? The above hadīth mentioned in Bukhari categorically proves that this journey was spiritual. In the beginning this hadīth states that the Holy Prophet (saw) was sleeping in Ka`aba and it ends with the words that when he woke-up, he was still in Ka`aba. This shows that the whole vision was seen by his heart that was awake while his eyes were sleeping. Hadhrat Ayesha (ra) states, swearing to God, that during M`eraaj, the body of the Holy Prophet (saw) did not disappear. Well, I agree. Yes, he’s alive! Of course! The truth is that He’s is alive and he will be alive till the Kalma is alive but in his spiritual status only. Disbelievers of Makka said to the Holy Prophet (saw) that they wouldn’t believe him unless he ascended to the heavens and then descend a book upon them. If the chief of Prophets can’t go then how could Jesus? [19:35] Such was Jesus, son of Mary. This is a statement of the truth about which they entertain doubt. [3:59] That is what We recite unto thee of the Signs and the Reminder, full of wisdom. [16:45] [We sent Our Messengers] with clear Signs and Scriptures. And We have sent down to thee the Reminder that thou mayest explain to mankind that which has been sent down to them, and that they may reflect. [4:171] O mankind, the Messenger has indeed come to you with Truth from your Lord; believe therefore, it will be better for you. But if you disbelieve, verily, to Allah belongs whatever is in the heavens and in the earth. And Allah is All-Knowing, Wise. [3:64] But if they turn away, then remember that Allah fully knows the mischief-makers. [2:13] Beware! It is surely they who create disorder, but they do not perceive it. [5:72] And they thought that no punishment would result from their conduct, so they became blind and deaf. But Allah turned to them in mercy; yet again many of them became blind and deaf; and Allah is Watchful of what they do. [3:57] ‘Then as for those who disbelieve, I will punish them with a severe punishment in this world and in the next, and they shall have no helpers.